You are here: Home / Real Estate / Resale Vs Under construction property: What should you buy? Should you be buying an Under construction property or look out for a ready to move-in flat or a resale flat, in today’s day and age. What matters and what should influence your decision, read on. 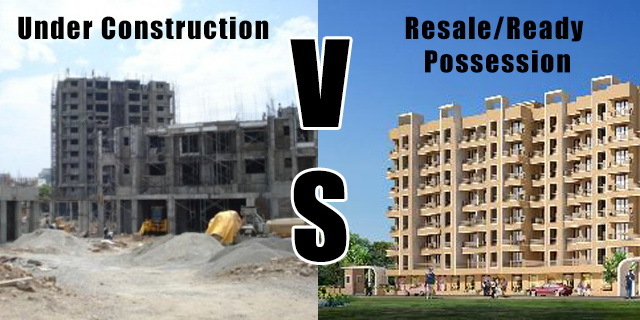 Under construction Vs Ready to Move-in or resale property; well, this is not the first time someone is writing about this and nor will it be the last and the debate just goes on and on and as they say to ‘each his own’; same goes for property. You will come across friends and relatives who will insist that buying an under construction property is best while some would say buying ready to move-in property is absolutely the wisest thing to do. So what should you as a consumer, be mindful of and what should you buy ideally- Under construction or Ready to move-in property? Well, simply the choice is yours. But in the current economic scenario and the kind of debts that the real estate markets are under, it makes a lot of sense to go for Ready to move-in property or resale properties and may I also add, they can be even 7-12 years old. The reasons are many fold. And while not many older properties have the kind of sophisticated amenities that the new constructions provide, they have a few things going their way that tilts the balance in favor of ready possession properties. The major thing in favor of ready to movie in property is that ‘You get what you see’. There are no surprises, no charts, no “artiste’s impressions”, no brochures for you to guess what will you be moving into 1 or 2 years down the line. It’s right there in front of you. No guessing the built-up area, super built-up, how much area you will actually get is right in front of you. All new constructions have a whopping 50-60% loading. It means that if a flat is for 1000 sq.ft., the actual carpet area will be around 500-400 sq.ft. So while you pay for 1000 sq.ft, you live in half of that area. This is on account of the amenities being divided per flat in a building; if the building has a gym or a garden or a swimming pool etc, then all that area is divided among flat owners and the total area is put across as ‘saleable’ area which is, as mentioned before close to half of the actual area. This is not the case in older buildings as loading is pretty low, close to 20-30% and hence the flats are larger and ‘value-for-money’. This is one of the major reasons that ready possession, resale flats are selling more off late, compared to under construction ones. If you come across an even slightly older property maybe a couple of years old, even then the maintenance would be pretty lower compared to under construction properties. The under construction properties have higher maintenance these days as even if the building has any one – a garden, podium parking, gym etc, the maintenance is pretty high. In comparison to that a 4-5 year old building will at times have almost half the maintenance. This is also a factor that works in favor of resale properties. The under construction properties will make you shell out extra cash for parking space. Yes, you may argue that the courts have ruled that the builders cannot sell the parking space, but unfortunately it hasn’t changed the reality. Just go hunting for property and you will know the ground reality. In contrast, the flats that are older will invariably have a reserved parking with the society of the previous flat owner and you would be able to get it by paying a nominal rent in your maintenance charges. In some cases you may come across sellers who would sell the parking space separately, but even in that case the charges will be lower than what the builder will ask for. With under construction properties the other factor is the added cost in terms of taxes and other charges. This adds close to 10 to 15% to your actual property cost. Service tax, VAT is applicable on new properties. Also you will have to pay a lumpsum maintenance charge upfront to the builder as maintenance for the first two years, till the society is not formed and a monthly maintenance fee is not fixed. These costs do not exist for ready to move-in properties that are resale. If you choose to buy a new property from the builder even in a ready possession flat, these charges will apply. 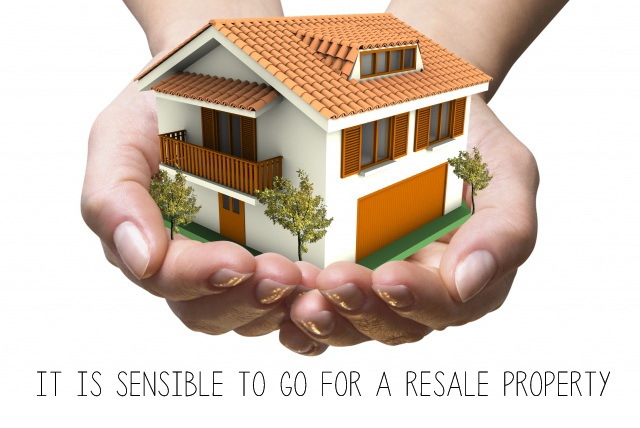 However, if the property is resale then you save these costs. The resale or ready to move-in properties are there for you to see and you do not have to anxiously wait to see the building rise from the foundation to completion. The times are tough in the real estate market and at times, a lot of projects are delayed or stuck for various reasons leading to anxious waiting days, months and even years and still sometimes the building is just frozen in time. All this is not the case when you choose ready possession or resale properties. When the building is under construction, you do not know what kind of neighbors you would have, and it matters to a lot of people. This issue is taken care of in case of resale flats since your neighbors are for you to see and while you do not know how they are in person; it does give a fair idea of the demographics of your neighborhood. The major advantage with a ready to movie in or a resale property is that all permissions can be checked since, once the property is complete and ready for possession, the documents like the Clearance Certificate, Occupancy Certificate, society formation certificate etc should be in place. In case they are not you would know it. If certain certificates like OC are pending then the application receipt can be checked. In case of new properties the documents you can check are the CC and while the builder may produce the certificate for a certain level of construction, you never know if while completion, he may violate some norms and then the remaining clearances may never arrive. So many examples come to mind and the more famous being the CampaCola Society which was in the news recently for its ‘illegal’ constructions. The few advantages that the under construction properties have over the resale one’s are that the payments are spaced out over a span of a year or two, giving you more time to arrange for funds. Also the newer constructions would give modern designs and living spaces compared to older ones. But in the current scenario even projects by big corporates like TATA Housing are being shelved after nearly two years of being under construction and the booking amounts are returned. You cannot be sure of what will go wrong and when, with under construction properties and even if it’s a very reputed builder, the current economy and the debts that the real estate industry is going through, your best bet is to go for Resale properties that are around 4-7 years old for better value for money or at least go for a ready to move-in new property but stay away from under construction properties unless, you have surplus cash and would only want to invest. Resale means the there is already a previous agreement which exists for the flat. It maybe be already purchased by someone from the builder and then he/she is selling it to you. Which also a perfectly fine way to buy/sell a property. Under construction means a property for which the work is still pending and the builder hasn’t given any possession. A person can buy such a property from a builder as well as in resale. The only thing is the possession is given to the buyer only after the entire construction is completed. In your case as you say the property is 6 years old… it is a ready property.